The ColdStor™ Ice & Beverage Bin is a lifesaver..
You've been there.. you have got food & beverage items that must be chilled quickly.. but there's no space! Or, you have got to move cold storage items within a facility, and no matter what, they have to stay COLD! 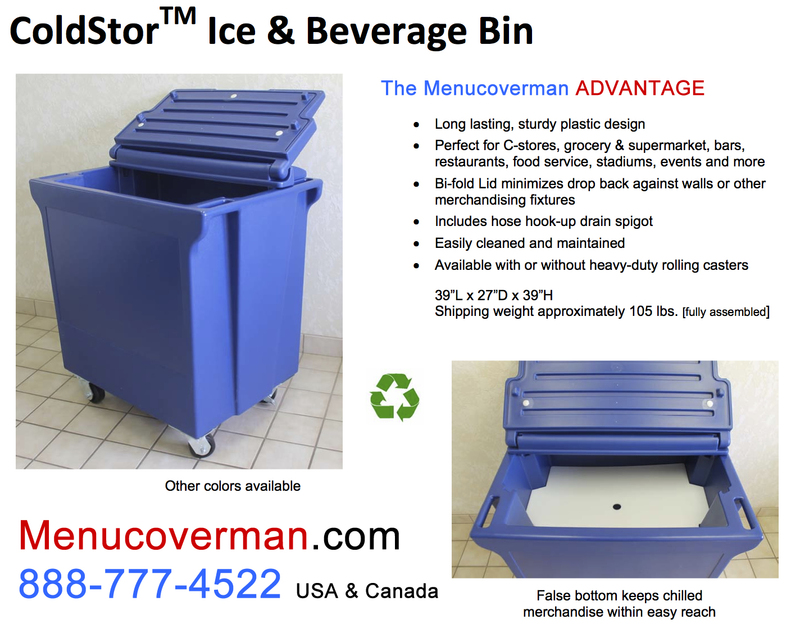 Here's the answer to your prayers: The Menucoverman ColdStor™ ROLLING Ice & Beverage Bin. Caterers: Consider the ease of use. Roll it on the truck, transport to site, and simply roll to where it's needed. The ColdStor™ bin will handle the BIG jobs! The creative uses this versatile rolling cold storage unit will offer are truly amazing. Ramp up when the action is heavy.. send them back to the bench when things quiet down. 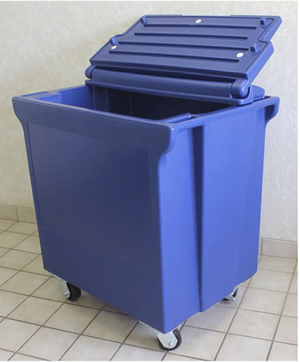 Virtually indestructible, the ColdStor™ Ice & Beverage Bin can be shipped to you FAST. Please note the quantity discounts now available. Units can be supplied without casters.. please inquire if that's your need. Please note: Freight can be expensive, as each unit must ship on its own pallet. Feel free to specify your own contractual freight carrier, or to inquire about direct pick-up at our US factory- which is in Kansas City, MO. Please scroll down the page for pricing. Please call for special pricing should you require 12 or more. Place your order in the cart. Freight will be quoted based upon your location. Your credit card will NOT be charged until you approve quoted freight charges. You'll enter your exact quantity in the shopping cart.